Irish monks were of great importance in Europe during in the early middle ages. Most famously, they were one of the sources of reintroduction of classical knowledge back into europe, not the only source mind you, it also came via Spain from the Moors and from Byzantium (the surviving eastern part of the Roman Empire). One of the reasons for this was the success of Irish monasteries, and that success came from what separated Irish monasteries from alot of those in the rest of Europe. Irish monasteries were places of learning (essentially the schools/universities of their day) and religious discipline, while alot of those in continental Europe tended to be quite relaxed and undisciplined, sometimes just places of retirement. One of the most famous Irish monks for Europe was Columbanus, he traveled throughout Europe and received alot of patronage as he was essentially shaking up the monastic system to make them more like the Irish monasteries, places of discipline and learning. Him and other monks spread Irish monastic foundations throughout europe, in places like France, Germany (pangur ban was actually written here), England, Scotland(converting both these last to Christianity), Switzerland (the city of St Gall), Italy (Bobbio) etc. Charlemagne actually also made a law that all monasteries had to provide free education to non monks, so an area of each monastery was used for this, creating the first real places of education in Europe (though obviously only a small minority of the population bothered with this). On a side note, its one of the reasons why the early Viking attacks were seen as so abhorrent at the time and what people often miss these days, its like if a modern army attacked a modern university, armed men picking on unarmed academics, not exactly a fair fight. Why would the nobles and kings bother about supporting these new monasteries though? Well these were militaristic men and believed they were going to hell unless they did something, so if they could fund a school of holy monks in their area, and ones who are genuinely religious, they may stave off their eventual fate in hell. Also Irish monks were known throughout Europe for having the best Latin. This was because the Irish had to learn Latin as a foreign language, so in France, Italy or Spain, where Romance languages were evolving, when they read Latin, they would speak it in their own native way. Some of the leaders, believed one of the reasons for ill fortune at the time was because of these new evolving languages. As Professor Philip Daileader said, they believed god spoke Latin and so he could not understand these new languages, it sounded like a strange form of gibberish when they prayed to him. So one of the ways to make god understand them once more was to go back to how Latin was spoken originally. As for the clothing of the figure, this is based on figural representations of monks in the book of Kells among other illustrated manuscripts of the time. 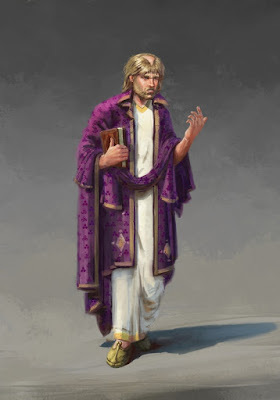 The wrapping and folding of the cloak around the arms and neck, is my guess at what some illustrations from the books may have been, it probably would have been both a long cloak and stole of some sort. Also the designs in the cloak, both the small and large, are based on ones found in the illustrated manuscripts. The shoe is from one in the national museum, its location is not known but there are quite a few of these lovely shoes found from the time. Also note the little shaved bit on the chin, you often see this in early Irish manuscripts, not sure if anyone knows why they would have done this but its something peculiarly Irish from the time. Also the book he carries is based on one shown again in an early medieval Irish manuscript. His hair is a unique form of tonsure found in Ireland during the time, called the V tonsure.